Redbook Magazine has invited Jennifer Weiner, Sarah Pekkanen and Goodreads for a LIVE Google+ Hangout session. This ‘summer beach reads’ event will take place on 17th of July at 12 pm ET USA (12 am Malaysian time on 18th of June 2014). Post them on one of these Facebook pages: Redbook, Jennifer Weiner, Sarah Pekkanen. Don’t forget to include the hashtag #RBKbeachreads and send them NOW! If you want to watch the live session, visit The REDBOOK Summer Beach Reads Book Club. Have you ever enjoyed a book so much that you have the urge to give a positive feedback to the author? I have! In my opinion, Twitter is the best way to do so because it allows global connectivity. I can communicate with authors at any time all over the world. Because of the limit of 140 characters, I have to be concise with my comments. MT"@emberzmars: Phew! You survived the week. What will you be reading this weekend? #weekendgoodreads Over the Edge" Say hi to Stan for me! This tweet was started by Goodreads. I included Suzanne Brockmann in my reply and was pleasantly surprised when she responded immediately. She gave me a teaser in her next tweet, which increased my eagerness to finish reading the book. Authors can also use Twitter to get ideas for their projects. Once I saw an author asking for any kindergarten teacher to contact her. Hhhmm could it be that she needed a muse for her next book? Last weekend, Romance Festival 2014 organised several Twitter live Q&A sessions. Hashtag #Romance14 was used to easily identify posts that belong to the topic. I was fortunate enough to get my question answered by the wonderful authors in Young Adult genre: Lydia Syson, Cathy Hopkins and Liz Bankes (see below for the first response). I have always enjoyed Twitter chats so that session was no exception. If you miss out on the chat(s), don’t fret. Just type #Romance14 into the search box at the top of your Twitter screen. I believe that every writer regardless of medium (books, television, academic research etc.) should be an active Twitter user. If you are a writer but need convincing about using Twitter, visit Twitter guide for authors and illustrators and Author Media. If you enjoy tweeting to writers and/or fans, please spread the awesomeness by sharing this post with your friends and followers. ps: This is a serial of blog posts about communication methods between author and readers. To read other tips, click #2 for Facebook and #3 for Pinterest. Goodreads is a global online community for book lovers. It includes many features such as book reviews, profiles of authors, discussion forums, polls. The database is not only limited to English books; it also includes Malaysian books e.g. Karim Raslan, Fauziah Ashari, Love You Mr. Arrogant. Budding authors, take note! You could join the ‘Goodreads Author Program’ to reach a wider target of readers. This post is a simple guide to the desktop version of Goodreads website. I will distinguish the experiences of a Goodreads member and those of a non-member. 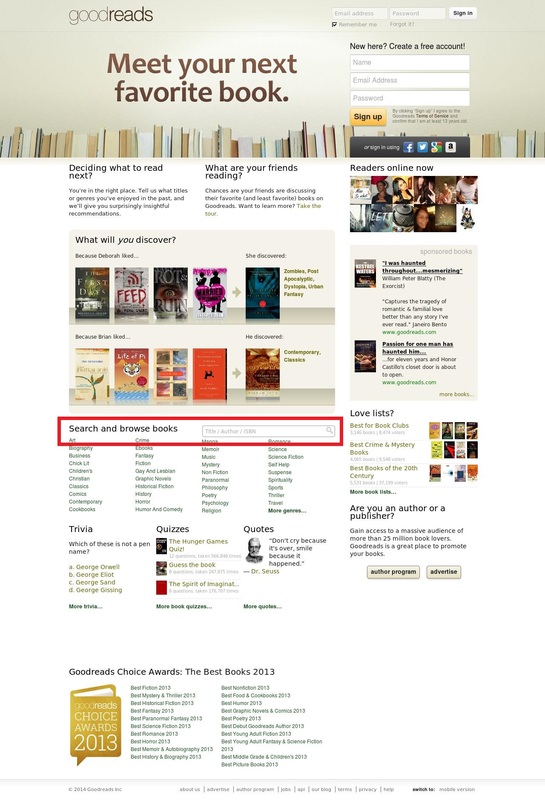 You don’t have to become a Goodreads member to search for details of books. Just type in the book title, author or ISBN in the search column located in the middle of the webpage. You could find the search column inside a red box in the attached image. Click on the image to get a better view. What does a non-member get to do? There are already many great features provided for non-members. Why do you need to get an account? Goodreads members get MORE benefits. Once a member is signed in, a dashboard will appear. As you can see in attached image, the search column is easily located in the main navigation bar (refer to red box). There is no need to scroll down the page. Those aforementioned points are the features that I regularly use. Now that you have read and perhaps evaluate the different experiences, what have you decided? If you like using Goodreads, share this article with your friends!